Chapter VII of The Life Divine is named ‘The Ego and the Dualities’. 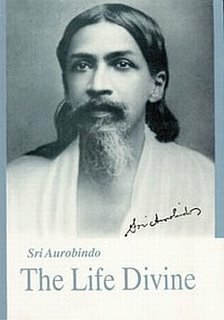 This is an interesting chapter as the principle which Sri Aurobindo terms as the ‘ego’ has an unique place in the manifestation. The ego is not held in high esteem in traditional spiritual practice because it cannot judiciously harmonize the different parts of the being. Yet without the ego, individualization cannot begin. In Integral Yoga Psychology that is based on the Aurobindonian standpoint, the ego has to be replaced by a ‘beyond-ego principle’ for proper harmonization of the myriad and discordant elements of the human psyche. It is only then that a process of true individualization can begin. However, in this chapter, Sri Aurobindo does not examine the ego from a primarily psychological perspective. Neither is there an attempt to understand it from the conventional ethical or moral poise. Of course, He will later place the ego-principle in its correct psychological perspective and examine whether and how it can undergo a transvaluation. But in the present chapter, He is concerned with the metaphysical necessity of the ego. In India, traditional spirituality is concerned with the abolition of the ego. Hence, a metaphysical necessity of the ego-principle may sound strange. Sri Aurobindo Himself is concerned with replacing the ego by a fourth-dimensional principle. Yet He does not ignore the significant part played by the ego in the cosmic scheme. We have seen that ‘Reality’ which is difficult to be described with words was also experientially perceived as ‘Sachchidananda’- a triune of ‘EXISTENCE-CONSCIOUSNESS-BLISS’. Now, these three principles-EXISTENCE (SAT), CONSCIOUSNESS (CHIT), ANANDA (BLISS) are not additive. Sachchidananda is not a summation of these three principles, neither it can be viewed in gestalt terms (i.e. it is not a whole that exceeds the sum of its parts). RATHER, EACH PRINCIPLE REPRESENTS A PARTICULAR POISE OF THE SAME REALITY.EACH PRINCIPLE CONTAINS THE OTHER TWO IN ITS ESSENCE. That is why the Sachchidananda consciousness is referred in Transpersonal Psychology as the ‘unitary consciousness’. As long as there is no ‘creation’, the unitary consciousness of Sachchidananda remains self- absorbed, self-sufficient and self-fulfilled. The problem arises with the manifestation of ‘creation’. ‘Creation’ automatically implies the emergence of ‘multiplicity’. To permit the emergence of ‘multiplicity’, the ‘unitary consciousness’ of Sachchidananda has to change its poise. It loses its unitary nature and the three hitherto intertwined aspects of Reality; ‘Existence’, ‘Consciousness’ and ‘Bliss’ become gradually de-linked from each other. (1)	Each aspect (Existence; Consciousness; Bliss) of Reality becomes separated, fragmented or diluted and gets to be expressed in multitudinous ways. (2)	Each aspect ultimately has the potential to get expressed in opposite terms too. This is a price that has to be paid for a multiple expression that automatically implies infinite variation. Thus instead of the unitary Sachchidananda consciousness, we have as a culmination of infinite variation, the divisive phenomena of death, entropy, ignorance, falsehood, and suffering. Every divisive term of each aspect develops into an independent, unique, distinct form that is ‘separate’ from everything else in the universe. At the lower levels of the evolutionary hierarchy, this ‘uniqueness’ is ‘species-specific’ (thus each species of ‘plant’ or ‘animal’ has its distinct genus-specific identity). This is why biologists study plants and animals in terms of their ‘species’ or ‘class’ characteristics. The concept of ‘uniqueness’ is different in the case of human beings. Biologists study the species characteristics of homosapiens as a genus in comparison with other animal species. However the study of human beings as belonging to a species is not sufficient to understand the uniqueness of the individual human being and the diversity among human beings. In human beings, the ‘uniqueness’ is personality-specific in case of individuals and ‘culture-specific’ in case of human collectivities. That is why the psychologist studies the individual human personality and the social anthropologist studies cultures and societies. Indeed, the psychologist considers his knowledge as more ‘specific’ for the individual human being rather than the biologist who studies not the individual human personality but ‘homosapiens’ as a species and the social anthropologist who studies human beings in the context of group-behaviour. The transition from the unitary consciousness of Reality to the multiplicity in creation automatically implies that there must be an intervening variable that maintains the multiplicity. If this variable was absent, the multiplicity would cease to exist and creation could not be sustained. Metaphysically, this independent variable is a poise of the ‘SAT’ or ‘Existential’ mode of the Supreme Reality or unitary consciousness. It is in this poise that Reality is conceived as the SELF or ATMAN. Thus the essence of every form, animate or inanimate, is the same, the difference being only in the realm of the degree and quality of manifestation. In the human being, the Self has more potentiality for a rich and variegated experiential expression. However, the experiential realization of the same Self (or unitary essence) in all forms of multiplicity satisfies our metaphysical quest, it does not explain why each form of the multiplicity has an exclusivity that cannot be shared by other forms. If the essence of each form is the same, why do we have the difference between forms? It seems that in creation, the appearance of the multiplicity is accompanied by a sort of forgetting of the unitary essence in each form. In a way this forgetting of the unitary essence in each form was necessary so that each form could grow, albeit selfishly, to its maximum potential. In other words, the divisive nature of every form must be actualized as far as possible or else creation would not be variegated, complex, rich and fulfilling. Naturally, in the process, the unitary essence in each created form has to be forgotten. We have now a very complex situation. On one hand the unitary essence in each created form has been forgotten or kept in abeyance so that each form can grow ad infinitum in contradistinction to other forms. On the other hand we need to explain how each form carries out its agenda of individualization if the unitary essence is not active on the surface of things. This is possible by the substitution of the unitary essence by a temporary deformative variable that permits individual variation to proceed to the maximum limit without remembering that the essence of all forms is the same. Variability and multiplicity in creation cannot occur and cannot be sustained unless the unity-factor in the consciousness of creation is temporarily veiled. This temporary variable that deforms the actual truth of the unitary nature of consciousness is known as the ego. There are naturally different poises of the ego at different planes of the manifestation. If there is an ego of the individual form like the individual human being, there is the ‘collective’ ego, the ‘group’ ego, the species-ego. Sri Aurobindo explains that the multiplicity is maintained by the ‘EGO’. Each individual form has to maintain its uniqueness, assertiveness, and distinctness. This is possible only if the ‘ego’, which is at the ‘centre’ of each individual form or group-form, gives ‘restricted’ or ‘limited’ values to movements and forces instead of ‘universal’ values. Take the example of human love. Obviously, human love is selfish, possessive, demanding and conditional. It is so because the ego ‘gives’ these values to love. Once, human love is given ‘universal’ values, it becomes unselfish, non-demanding, non- possessive and spontaneous. The individual has then succeeded in ‘universalizing’ oneself. The ‘ego’ however cannot per se do this work of universalization (even if it is involved with so-called unselfish acts); one has to go beyond one’s ego to achieve this status. This is specifically why mystics, saints and seers have always advocated that the ‘ego’ needs to be transcended. (a)	GET RID OF THE EGO COMPLETELY. A significant section of Indian spiritual geniuses attempted this path of egolessness. They had the ‘reward’ of ‘experiencing’ the Sachchidananda consciousness. This ‘experience’ was so overwhelming, total and complete that the world of multiplicity became secondary, unimportant, ’unreal’ and ‘unworthy’. Instead, they preferred a world-shunning ascetism. Determinative - as it has to maintain the uniqueness of the individual form in a world of conflict, competition, chaos and disharmony. It accomplishes this by a ‘self-limitation of consciousness by a willed ignorance of the rest of its play and its exclusive absorption in one form, one combination of tendencies, one field of the movement of the energies’. (The Life Divine,pg65) Temporary - as it has to be replaced at an optimal point of personal growth by a wholistic principle that can really harmonize the myriad, discordant elements of the human psyche. The ego is too skewed to accomplish this. Deformative - because it does not reflect the unitary Sachchidananda consciousness. Instead, it reflects the exact opposite of Sachchidananda in earthly existence. Makes claim on claim, all debt to her he shirks. A sordid part; no corner void is left. And steeped in Thy world-infinity to live. Then lost in light, shall fade the ignoble spell.